Shot Blocks during, and Chocolate Milk afterwards! To keep running for the rest of my life; no matter the speed or distance! To run the NYC marathon someday, somehow…and do it my way! Originally started running when I was 48 (and 80 pounds heavier) to improve my health; now I run because of how ‘alive’ it makes me feel! And the friends I’ve made through running keep me coming back. Approaching the finish of the 2011 Long Beach (CA) marathon, about 2 miles out from the finish, having a calm sense of success come over me knowing that I had accomplished my years-long goal of my first sub-5 hour PR. And I did it with the 5 hour pacer almost the entire way; I think that is when I decided I wanted to try pacing myself to help other runners, especially beginners, accomplish their goals. I’ve always been a ‘volunteer’ at heart; and with the start of my running years ago I had some great ‘coaches’ who helped me learn and flourish. I now feel obligated to ‘pay it forward’ and help others change their lives through running, as I have mine. 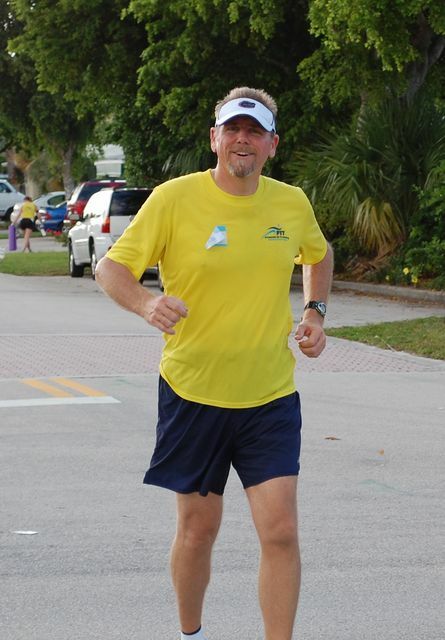 The Rock & Roll ½ marathon in Miami Beach in 2011, I paced the 2:30 group with Marcela Todd, and we had about 5 runners come all the way through with us to finish just under 2:30. We had so much fun talking with lots of runners during the event and helping everyone relax and try to enjoy it. It was also funny when we’d ‘pick-up’ runners out on the course that had dropped back from their faster targets, and didn’t think they could finish (and were slightly mad we were passing them), but we convinced them to finish with us and make the 2:30 mark. I will do my best to ‘keep them entertained’ and make it a fun experience through the comraderie of the group; a race should be something to enjoy, with no doubts about your ability to FINSH! We’ll share stories along the way of life’s struggles we’ve all overcome to get here, and focus on encouraging each other to ‘hang in there’ with us. At the end I am going to ‘push’ everyone to ‘leave me’ and make their own new PR! Stay focused on an even and consistent pace (first mile same as the last mile!). Remember the importance of hydration and nutrition during the event, come prepared. Think about who is out there cheering you on and who supported you during your training; in some ways you are running for them too. And have a plan for what you want to do after your PR finish to celebrate. Now let’s have some Race FUN! Having been an assistant coach with FIT for a few years now, and watching many of my ‘ducklings’ go on to their first ½ and full marathon success, I found out that pacing has become my new passion, almost surpassing even my own desires for new PR’s.